‘…it’s a constant work in progress to continue letting go of what I want for my life and my career, and trusting God to take it to the place He wants it to be. When you come to the end of all you have, that’s when you start to discover the beginning of all God has in store for you. The key word in that whole song is “seems”. The enemy wants you to think there’s nothing left and that it’s done — but it only SEEMS that way because God is faithful and He has bigger things in store…’ One of 2012’s most anticipated newly signed artists, alongside others like Moriah Peters, Rhett Walker Band and Lindsay McCaul; Karyn Williams, who unveiled her debut project on Inpop Records, has continued to be one of my favourite, honest, powerful and poignant female vocalists I’ve heard in recent memory. With vulnerability, energy and heartfelt messages in the form of songs like “Rest in the Hope”, “Call”, “This is Freedom” and “Hey There”; Karyn’s sophomore release, Letting Go of Perfect, is an album full of promises and hopeful convictions as Karyn’s signature pop/acoustic style is evident throughout these 10 tracks. Though much more experimental this time around, from acoustic in “Who Says”, to worship in “Great is Thy Faithfulness” and electronic in “Running to the Sea”; what remains the same is Karyn’s heart to deliver music that points straight to Jesus. While it has been a while since album releases, Karyn’s music is well worth the wait, especially if you are a fan of her previous material, or if you enjoy similar artists like Amy Grant, Natalie Grant or Rebecca St. James. Since her highly prolific and inspirational debut album, Karyn has delivered hit after hit- “Ordinary Angels” and “Who Says”, both included on this album, released in 2013 and 2014 respectively, and while I may have preferred two newer tracks to be included on this album (maybe a tracklist of 12 instead of 10? ), both these two aforementioned songs are nevertheless some of my favourites from Karyn, each of them exploring a genre different than CCM. “Who Says” features Karyn playing the ukulele as light acoustics, piano and Karyn’s powerful vocals hauntingly refresh the song and its central theme of how we can see God ‘…everywhere we turn, His fingerprints are visible…so who says, you can’t see love, who says you can’t see God…’ Simple musically, without any grand musical ingenious a la Rend Collective, or pop/rock goodness like Third Day, Karyn’s devotion to presenting a simple theme of us knowing that Christ is everywhere, in a profound way of using the ukulele to do that, is what makes Karyn one of my favourite female artists currently. “Ordinary Angels” does a country turn as Karyn sings a melody that could’ve easily (it’s not too late) been released to country radio as well as Christian radio. Presented as the final song released to iTunes on Inpop Records (“Who Says” was released independently), this melody full of southern gospel/country undertones is a testament to the work of God in the little and small things, that ‘…just because God doesn’t part the sea, pull you from the fire, doesn’t mean that He’s not there, His fingerprints are everywhere…when you need it most, the world is full of ordinary angels…’ While not everyone’s cup of tea (I can see that someone around the world will take more of a liking to CCM or rock compared to this fun-filled melody), its message is core and central to our faith- that God will use whomever He uses to encourage us on our walk with Him. Well done Karyn for these two promotional singles, and some of my favourites melodies on Letting Go of Perfect. The first official single on the album, “You are My Rest” features the vocal talents of Karyn as well as American Idol alum Danny Gokey on backing vocals as the two of them deliver one of my favourite CCM singles I’ve heard this half of 2015. With a pulsating drum kick and an infectious melodic beat, we are reminded that ‘…You never said that the rain, it wouldn’t fall, You only promised to be there through it all…’, a message we all need to hear, maybe even one more time today as the pressures of life can sometimes make us forget. While not necessarily your most publicised single of 2015, it is one of the most meaningful I’ve heard from any artist. With heart and fervour, passion and grace, Karyn invites us to partake in resting, laying at Jesus’s feet and knowing that His presence is all the rest we need to lean into each day with expectation and excitement. “Head Up” and “Running to the Sea” are some of Karyn’s more experimental tracks, with the former being littered with acoustics and hand claps, and the latter being presented with a bunch of electronic keyboard and vocal effects. “Head Up” is a swaying melody, a testament to who we are as Christians- holding out head up high and looking to our Father for His guidance in circumstances beyond our control; while “Running to the Sea” is an invitation to run with all our passion and conviction to a God who knows all and loves all, like a river running to the sea. As spoken by Karyn herself, ‘…[Running to the Sea is] a little ’outside the box’ for me, and that’s the fun of working with great producers who push you creatively. I believe there is something for everyone on this record—from high energy sing-along songs to quiet moments in worship…’ While I may not have pictured Karyn ever delving into a genre displayed in “Running to the Sea”, its execution is far from a disaster, and her new direction is welcomed, by myself and hopefully many of her fans around the world as well. Recorded first by Charles Billingsley on his own worship album Only Jesus, “Nothing Less (Great is Thy Faithfulness)” is as powerful and emotive as they come, with Karyn unveiling a song that could easily become one of the most poignant and heartfelt worship songs in the upcoming weeks and months ahead, maybe even slotting into the Sunday morning song setlist in churches around the world? Written with her husband Brian White and Pocket Full of Rocks frontman Michael Farren, “Nothing Less” is a re-working of Psalm 91, as we see originally David declaring in the chapter of God’s faithfulness, regardless of how we feel or even believe at the time of declaring. Standing at over 5 minutes, Karyn presents a near flawless version of the melody (the only gripe is that this, and “God of All Comfort”, are the somewhat lone representations of music of the reflective kind, in an album full of diversity, sometimes too much), and once again another standout. “Lately” brings down the instrumentation even more, with another acoustic melody, and a message of coming together in realisation of our thoughts, that ‘…maybe what I’m chasing ain’t what I’m looking for…and now I finally see that all I really need is right in front of me…’, while “God of All Comfort” further asserts the truth that God comforts all in all circumstances, and places Karyn in the midst of the piano again as the song’s primary instrumentation as the theme of us needing the comfort of God is conveyed. Yet it is the two upbeat album enders “Since You Opened My Eyes” and “To the Sky” are once again some of the most unique and powerful melodies on the album. The former is a radio friendly upbeat song about God taking away every moment and circumstance that blinds us towards Him as our eyes are opened in a figurative way, while the latter explores 80s music and an effect of record player noises as Karyn fuses the familiar with strong drum beats and conviction as she declares in the chorus to ‘…lift your anthem to the sky, let the people see your life, and the world will see His love in our eyes…’ Uplifting, compelling and even at times confrontational, both these two tracks are some of the most different songs I’ve heard from Karyn in a long time, ever since “Possible” way back in 2012. ‘…I realize that there’s a lot of music out there that people could choose to listen to. So my prayer is that I’m not just adding to the noise in the world, but that I’m adding to the message of hope. I’m honored anytime someone plays my music, because the song they are listening to is a piece of my heart put to a melody. 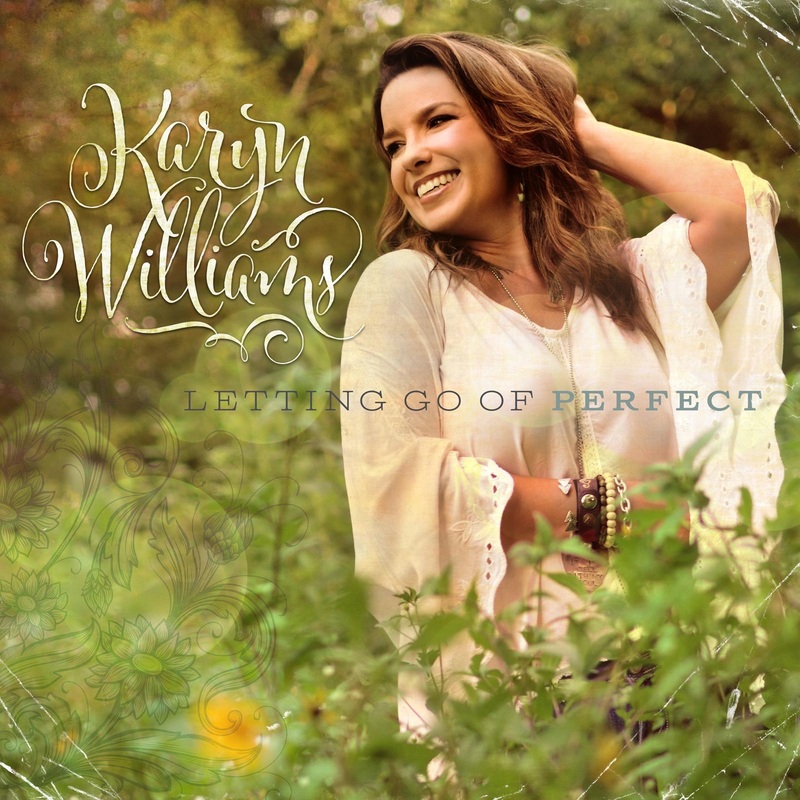 I pray that the Lord would speak to people through these songs, that they would be a source of strength & encouragement…’ Karyn Williams’s second album is a long time coming (3+ years), yet the wait is well worth it, as the diversity of Letting Go of Perfect continues to assert Karyn’s relevance in a CCM industry that is continuously evolving. Artists come and go, and sometimes artists that make a big splash with a debut album sometimes fall into oblivion. So to travel through the sophomore slump with such grace and emotion that is presented in this new album is a feat in and of itself. From “Ordinary Angels” and “Who Says” to the first single, this is an album worthy to be placed within my top 20 albums of 2015 so far…definitely within my top 10. Maybe with a few more listens, it could climb up to at least #5…we’ll see with time. Kudos to Karyn for such an encouraging and emotive album!